Every once in awhile, I will go for this kind of look. but sometimes I crave something more "fancy". or you're only running errands. who says you can't get dressed up for no reason at all?! will think about their outfits. "Where is she going all dressed up like that?!" In my 20's, I used to think like that. and how my outfit is "too this, or too that"
or where people think I'm going, or what I do. They can think whatever they like. (P.S. I forgot to mention how much I love this peplum top. The lace caught my eye & love the peplum! I feel the same way.... & who cares, dress for yourself. That is what really counts! I LOVE to get dressed up! With people always wearing Uggs, velour pants, hoodies, or their PJs, I LIKE to get dressed up. Sometimes I do it just for myself. And it feels AWESOME! Love the black and white striped peplum top. I have one similar to yours that I love -- wear it with yellow so I probably look like a bumble bee. I like yours with the red! 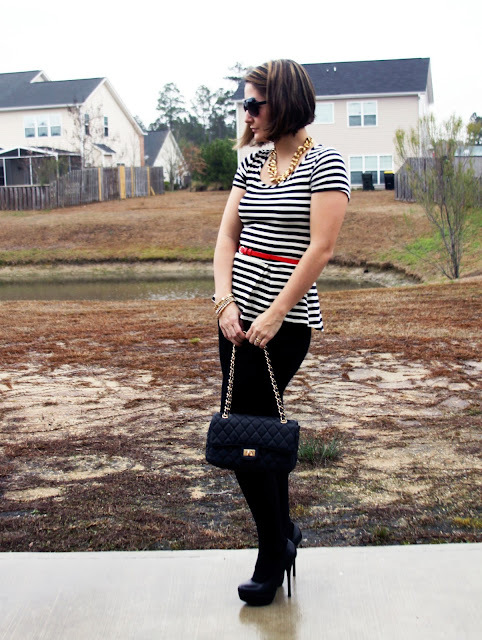 The striped peplum is so pretty and I love the red belt! I love dressing up and always being the more "dressier" one - I never mind it! :) I love that your necklace is Wet Seal.. what a fabulous find. And I personally believe you can never wrong with a peplum. 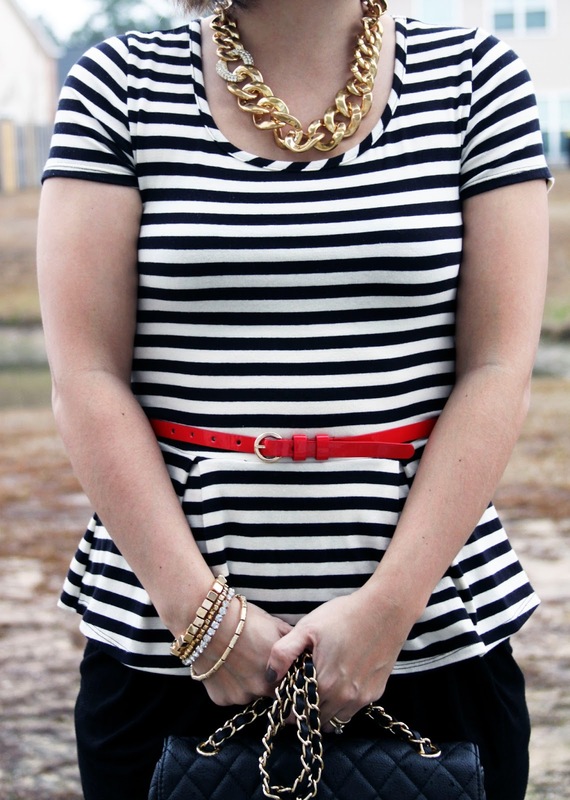 Found you via the Real Girl Glam linkup! I LOVE a good peplum top!!! Super cute! I absolutely love your outfit! I found your blog through the Pleated Poppy:) I'm a huge fan of peplum and I love yours:) I also like the pop of color in your belt too:) Have a good evening! Thank you! Peplums are the cutest thing ever! !